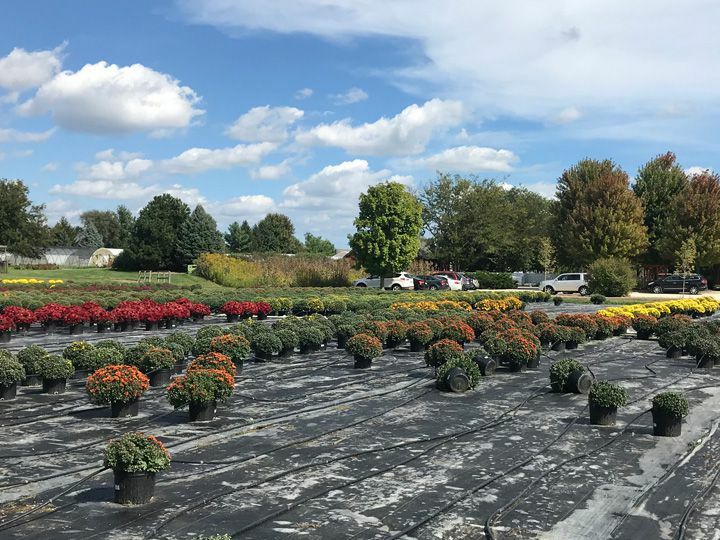 It’s no secret we take care to offer a large variety of mums each fall. Priced economically and available in many sizes, the mums keep our Annual Department hopping with activity as they replace what quickly sells from the shelves. But do you know what goes into providing over 10,000 mums to our customers this year? That’s right! 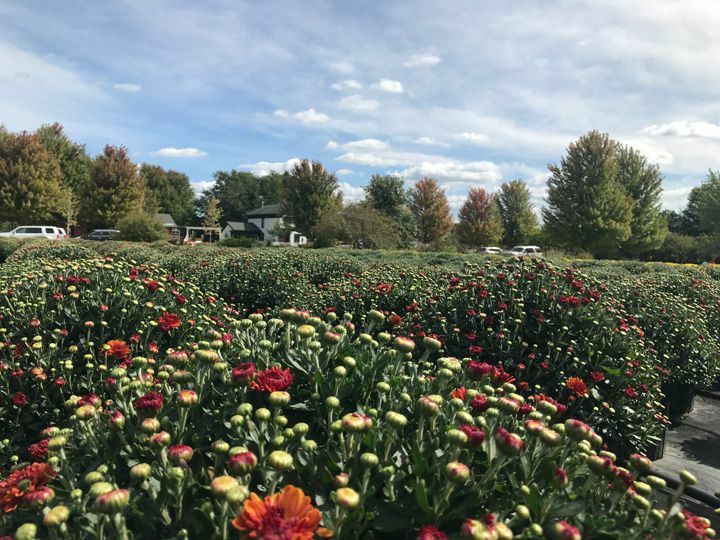 We grew approximately 6,700 10-inch mums, 2,000 8-inch mums and 2,000 4-inch mums at our Aurora location. Last fall we listened to customers, researched what sold, and replaced upright varieties with naturally round varieties. The mums started off as vegetative plugs that we cared for in the greenhouses during May. In June, we planted the 8- and 10-inch sizes in the field and the 4-inch in the greenhouse. What are some benefits of providing over 50 varieties in 6 colors? View from the 10-inch mum field. We are able to offer you a full array of colors that bloom from September through November. The European ball-shaped varieties have buds from the pot all the way around and have early, mid and late season bloom times. Early season mums are bred to bloom out by mid to late September. Mid-season mums bloom out around the third week of October. Late season varieties don’t even burst until mid to late October. Of course, blooms are weather dependent. When it is really hot, they will bloom early. Luckily this fall has been relatively cool so there are plenty available that are just starting to open. If you choose a 10” mum with flower heads that have not burst open yet, set it in the sun and expect about 6 weeks of color once it blooms. Most fall annuals, including mums, need full sun, at least 6 hours of sun. Once they start to open, they will continue to open with less than 6 hours of sun. Mums that receive a bit of shade once opened will last longer than those placed in full sun. Many of our customers leave the mums in their original containers and ‘drop’ them in existing containers on the porch or deck. This is just fine since their growing season does not require roots to grow and take hold. Fertilizer is not necessary. Daily watering at the root ball, not on top of the flowers is recommended. If mums are placed in mixed containers, depending on weather and container size, water every day, or every other day. Cold tolerant annuals, such as cabbages and kales, will survive a light frost. Protect mums and other fall annuals from heavy frost by bringing them into the garage or covering them to keep the frost off. If your mums do get touched by frost, wash it off before the sun hits the blooms. Dale, Annual Production Manager and Head Grower, says “It’s a joy to produce the quality of what we sell. You can see it in the quality of the plant material.” So, ‘mums’ the word on how easy it is to add pizzazz to your curb appeal! With over 50 varieties in reds, oranges, yellows, pinks, purples, and whites, the hardest part is choosing the ones that are right for you before they're gone!